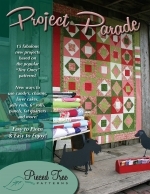 There are four easy ways to buy any of the Pieced Tree Patterns products. Order online at The Quilted Forest. Order by phone at (641) 585-2438, or toll free at 1-877-985-2438. Order by sending a fax to (641) 585-1739. Order by sending an email to shelley@thequiltedforest.com. If you are placing an order by fax or email, please provide us with your name, mailing address, and a telephone number where we may reach you to confirm your order and make payment arrangements. All Wholesale requests should be directed to The Quilted Forest at (641) 585-2438 or 1-877-985-2438.